This site is dedicated to the memory of Lester Young, one of the world's greatest jazz stylists. Dominic Green listens to John Coltrane 's "Both Directions at Once. The Lost Album" and discusses what he calls the saxophonist's "late style", comparing it to Coltrane's early and middle style, and finding that the fact that "The Lost Album" was celebrated as the year's most significant jazz release says a lot "about the health of jazz in 2018", ending with this statement: "For it is a sad fact of musical history that after Coltrane, there was nothing left to say on the saxophone. But Kenny G said it anyway" ( Weekly Standard). --- Kevin Sun transcribes and annotates nine solos by Lester Young, namely his saxophone choruses on "Oh, Lady Be Good! ", "Exactly Like You", "One O'Clock Jump", "I Know That You Know", "Taxi War Dance", "Twelfth Street Rag", "Bugle Call Rag", "Broadway" and "Beautiful Eyes" ( A Horizontal Search). From Mosaic Music: The fabulous Carnival of Swing on Randall Island. - On YouTube right now! The Savory Collection with all Basie-takes has arrived. Stunning and very valuable. Again and again: Young was "miles ahead" of all others in his time - He and Basie invented a whole new era in jazz. Again thank you to Mosaic Records - You made my Day!! Frank Sinatra talks about Lester Young in an interwiev. Lester Young loved Frank Sinatra records and Frank loved Lester. Now, we might recognize Arlene Francis for her decades old run on the game show What’s My Line? but there was also a 23 year run on WOR Radio in New York where she was host of a popular talk show. In this fascinating clip, Arlene interviews Sinatra, as he answers her question of whether it’s important for an instrumentalist (or conductor) to understand the lyrics of a song. Interesting! The brand-new Basie/Lester Young SAVORY can be found on iTunes. 22 exiting takes from the 1930'ies: "Savory Collection Vol. 2". Lester Young’s Greatest Rare Solo? “This might be the greatest almost unknown 16-bar solo of Lester’s career - it’s a match to the Mili LIFE photo of Lester and Big Sid. Earliest interview with Lester Young: 1947 WMEX Radio Station between May 26. and June 8. From Savoy Ballroom Boston. - B.B. King reflects on Lester Young! It starts with him responding to recordings we don't hear for a Blindfold Test but then it opens up. A friend of Lester's (probably his manager Charlie Carpenter) says that when Lester talks to HIM, he talks English, not what he's doing now. But there are many treasures to be found in everything Lester says and HOW he says it. Wayne Shorter meets Lester Young. Lester Young & Charlie Parker Birthday Celebration. I often read and/or heard that Lee Konitz was deeply influenced by Prez. Sure I could hear the emphasis on melodic lines, but when I asked him about it, in a very Konitz way, he just replied that he listened to Prez among others. So, I was never sure about Prez's influence until we played for a week at the Jazz Standard (NY). Each day of that week, we walked down the Jazz Standard stairs, Lee in front, and I observing in the back. There were lots of Jazz pictures, but he only stopped at the last one. That was Prez's picture and Lee said would make the same comment: that's the man!!! Now I know!!! Brandnew CD set "Dinnertime for Hungry Collectors"
North Side Jazz: Lester "Pres" Young in Minneapolis: The Formative Years. New Savory: Jumping At the Woodside/Basie Orch. & Lester Young 1939. New: Photos of Lester Young. Lester Young - Southland Café, Boston. New important book with many new details about Lester Young. Brand new photo from Frankfurt, Germany 1956. And, the wonderful "Mean to me" from Art Ford´s jazz party. Storyville recently released a new album with new exclusive material - you can find it here. Check out this link to newsweek for some audio exclusives - Especially video 2: Count Basie's playing "Bugle Call Rag". Enjoy. The Savory Collection” consists of 975 discs with recordings of live performances broadcast by radio stations in the late 1930s, the height of the swing era, and into 1940. 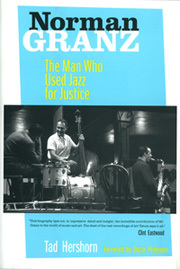 Recorded by audio engineer William Savory, the discs feature Louis Armstrong, Benny Goodman, Count Basie, Billie Holiday, Fats Waller, Bunny Berigan and Lester Young, playing in the relaxed setting of a nightclub or ballroom, rather than the confines of a recording studio, where songs could not exceed three minutes in length. For that reason, and the quality of the music played, Loren Schoenberg, the executive director of the National Jazz Museum in Harlem, describes the Savory collection as “one of the greatest finds” in the history of jazz. Below here you will find a sample of Lester Young - Tea for Two, which was recorded alongside with trumpeter Roy Eldridge and members of the Benny Goodman and Artie Shaw bands. The sudden and unexpected key changes in "Tea for Two" have always appealed to jazz musicians, and the top-flight ensemble assembled here really takes the song for a ride. Top honors go to Young's, free flowing solo, which is capped by a second chorus that Mr. Schoenberg calls "a wild, spontaneous moment of abandon". Released on november 4: The Jazz aux Champs-Élysées CD. They will add audio to the above site within a week, they say. "Why Lester Young Matters – jazz.com"
The well-known Kansas City Six session with Lester Young made for the Commodore label is listed everywhere as recorded on September 27, 1938. It was made by Columbia for Commodore, and Columbia master numbers were assigned to those titles (P23421-25). Strangely enough, those numbers seem to come from an earlier date: Masters 23415/18 (Leighton Noble Orchestra) are from September 7. 23419/20 are not known and 23428/33 (Al Donahue) are from September 9. Futher, 23426 (presumably not issued) was listed in Columbia cards as made for Commodore on September 8 (details unknown). (23427 was assigned to a remastering of a Rev. Gates 1929 recording). From the above, I incline to think that the actual date of Kansas Citi Six session might have been held on September 7 og 8. Later: According to Rust the date is September 8. The new Lester Young celebration e-card added. Make sure to send them to your jazz-loving friends. July 29. 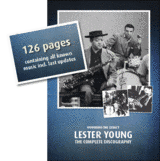 2009 - New Lester Young YouTube clips added! New Lester Young YouTube clips added to the Film and Movies page. Click hereto check them out. Enjoy! External seo links: Teamoptimering, Webshop Esbjerg.